The Acropolis is what Connie calls a “triple-header.” It is a UNESCO World Heritage Site, listed in 1000 Places to See Before You Die, and was nominee for the “7 New Wonders of the World.” That is a lot for a place to live up to and, I am sorry to say, it falls short. Or maybe I am too critical. After all, I was disappointed in the Pyramids and Machu Pichu. They, like the Acropolis, just didn’t live up to all the hype. Some of the Parthenon that you see today has been recreated and many of the statues, including the famous Elgin Marbles, have been relocated to various museums. The site is being renovated, a job that could go on forever, so scaffolding and cranes have become part of the scenery. Even if you can find a vantage point to avoid the construction equipment, there are the crowds to deal with. The Agora, in contrast, was wonderful. 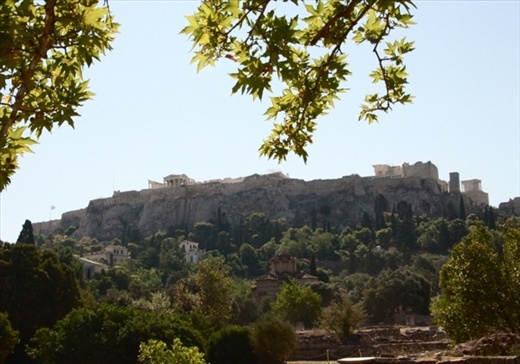 Lying below the Acropolis, these streets are where the action in classical Greece took place. Much is still in ruins but with a little imagination it comes to life. This is where the idea of democracy originated. Socrates held classes here, Greeks were selected for jury duty, and politicians who grew too big for their britches were “ostracized” – banished for ten years – by popular vote. Overlooking it all is the Hephaistelion, a mini-Parthenon. Unlike the more famous temple, it is mostly intact. You can’t go inside but it gives a real feeling for ionic Greek architecture. The Stoa of Attalos, the government buildings of old, have been converted into a museum containing artifacts found in the Agora.